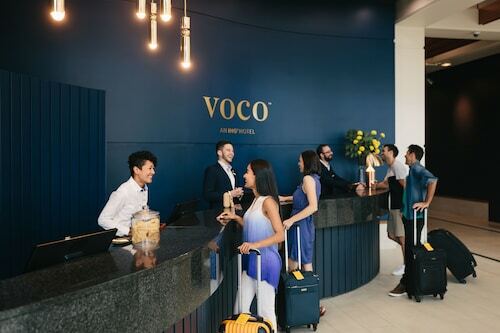 Overall, the hotel is good and location is excellent (walking distance to Cavill mall, beach, Surfers Paradise, Time Zone, Ten Pin Bowling, etc). 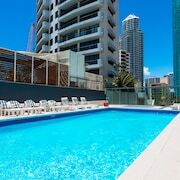 Right outside the tram stop and opposite Cold Rock, and only a 1 minute walk to the beach, and a 5 minute walk to the heart of Surfers Paradise. We came with a trailer and even had parking for us!Would definitely stay again as the location to the beach, surfers paradise and other attractions was perfect. This hotel was very convenient to go to the centre of Surfers Paradise, and rent-car office, and to use various kinds of public transports. The Southern Hemisphere offers half a world’s worth of weird places to go and wild things to do all winter long. Weirdest winter vacation destinations in the Southern Hemisphere. Opens in a new window. Great family oriented resort. A little tired and could do with an upgrade, however all amenities are clean and designed to make everyone smile. 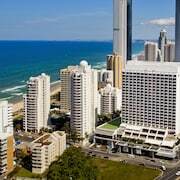 Which hotels are closest to the Surfers Paradise airport? 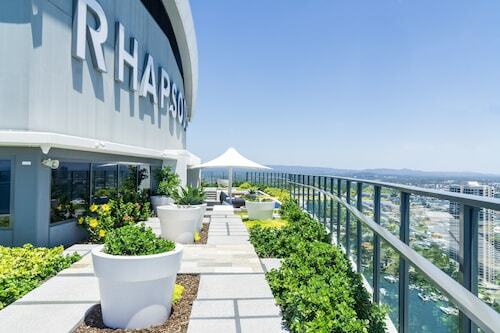 Where to stay near top Surfers Paradise attractions? What kind of hotels are in Surfers Paradise? 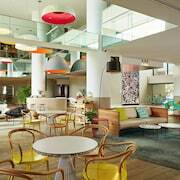 Which hotel chains are in Surfers Paradise? 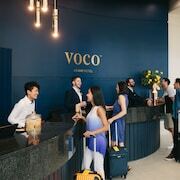 Families will find kid-friendly activities in Surfers Paradise, and visitors give high marks for the beaches, shopping, and top-notch restaurants. This city also attracts tourists with its spas. 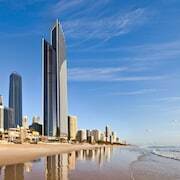 Top sights in the city include Cavill Avenue and Surfers Paradise Beach. Families come for attractions such as Timezone, RaceCentre Race Simulators Australia, and Draculas Haunted House. The city's natural setting is picturesque, including the beaches and these places to visit: Surfers Paradise Beach, Budds Beach, and Macintosh Island Park. 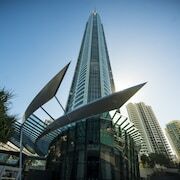 Shopping is one of the favorite things to do, so consider an excursion to Cavill Avenue, Centro Surfers Paradise, and Surfers Paradise Beachfront Markets. Genesis Holiday Apartments - With a stay at this 3.5-star apartment, guests can enjoy access to 2 outdoor pools and free parking, along with an in-room kitchen. 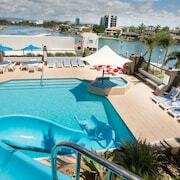 Peppers Soul Surfers Paradise - Our customers like the family-friendly amenities and beach locale at this aparthotel. This 5-star aparthotel features a restaurant, an outdoor pool, and an indoor pool. 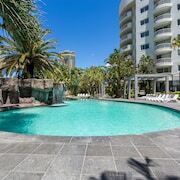 Surfers Paradise Marriott Resort & Spa - With a stay at this 5-star hotel, guests can enjoy access to a marina and 2 outdoor pools, along with free WiFi. Expedia customers like its family-friendly amenities and breakfast. Outside the city, popular places to see include Sea World, located 2.9 mi (4.6 from the heart of the city, and Warner Bros. Movie World, which is 9.7 mi (15.6 away. Surfers Paradise, QLD is the Gold Coast’s signature settlement and world-famous for its vibrant nightlife. High-rise apartments fronting the beach, 5 star hotels, and plenty of resorts and cheap motels attract visitors from all over the world. Jetsetters are drawn to world-class restaurants, but there is no shortage of inexpensive Asian eateries to keep you happy if you are on a budget. Queensland’s holiday metropolis boasts the most theme parks of any city in Australia, among them Warner Bros Movie World, Wet ’N’ Wild Water Park and Dreamworld. Combine this with world-class beaches and stunning rainforest hinterland and you have the perfect family holiday in the making. 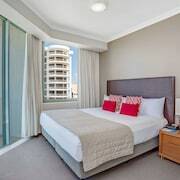 Affordable family accommodation in Surfers Paradise is easily found, making it a great destination for a vacation that everyone in the family enjoys. Backpackers are attracted to the many budget hostels. Many Surfers Paradise hotels are found in the high-rise buildings along the shore, granting breath taking views and sunrises. Surfers Paradise is only an hour’s drive south of Brisbane and has its own international airport called Gold Coast Airport (OOL). Bus routes 777 and 761 take you from the airport to Surfers Paradise. The main streets are Cavill Ave running East-West, with its beachfront pedestrian mall, and Orchid Ave running North-South, where many bars and nightclubs are located. 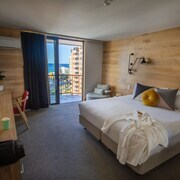 Find Surfers Paradise accommodation here on Expedia.com.au today. Whether you book into a hotel near the city centre to enjoy the nightlife, or a quiet resort in the hinterland to enjoy unspoilt nature – you will always be close to all attractions the area has to offer. 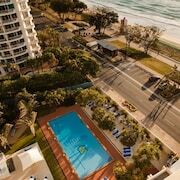 We will find the right deal for your Surfers Paradise getaway, always without a booking fee, of course. 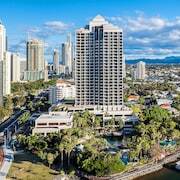 What are the most popular hotels in Surfers Paradise? 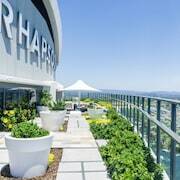 Are there hotels in cities near Surfers Paradise? 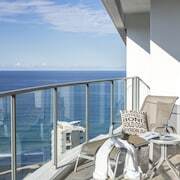 Explore Surfers Paradise with Expedia.com.au’s Travel Guides to find the best flights, cars, holiday packages and more!